Was it unreasonable for Ralph Nader to clash with the automobile industry over the safety of its products during the 1960s? How unreasonable was it for the outspoken consumer advocate to run for the U.S. presidency in the hotly contested 2000 election? 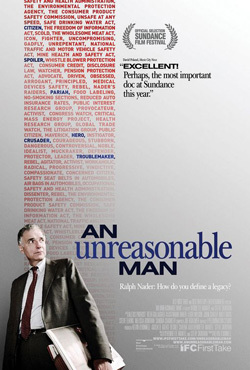 This engaging documentary reviews the life and career of Nader, the controversial, influential attorney and activist eager to impart his own inconvenient truths to the powerless and the powerful.